How to Turn the World by Hand? Pekin_Edinburgh_İstanbul yoluyla: Dünya Elle Nasıl Döner? * Arrow Factory, Collective ve PiST'in bir araya gelerek bir yil boyunca devam ettirecekleri tartisma, yayin ve sergi programina sahip uluslarararasi bir arastirma projesi. Her mekanda yil boyunca farkli sonuclari sunulacak bu projenin ilk toplantisi katilimci uc mekanin PiST/// Istanbul'da bulusmasiyla gerceklesecek. Bu surecte 26 Ocak 2011, Carsamba saat 18:00'de Arrow Factory ve Collective kendi mekanlarini tanitan bir konusma gerceklestirecekler** ve devaminda PiST, Pekin_Edinburgh_Istanbul yoluyla: Dunya Elle Nasil Doner? projesi hakkinda bilgi verecek. * Pekin_Edinburgh_Istanbul yoluyla: Dunya Elle Nasil Doner? Istanbul_Session_01, Creative Scotland'in destegiyle gerceklesti. PiST/// Foundation of Arts Initiatives ve Istanbul Guncel Sanat Dernegi'ne desteklerinden dolayi tesekkur eder. *** Pencereden her disari bakisimda cekik gozlu bir kadinin surekli dikis diktigini goruyorum. Belki de Edinburgh'da begendigim 'Made in Turkey' gomlegi de o dikmistir. How to turn the World by Hand? via Beijing_Edinburgh_Istanbul* is a year long international research project between Arrow Factory, Collective and PiST/// involving a programme of discussions, publications and exhibitions. Different outcomes will be presented throughout the year in each space. The first session of this project will take place at PiST///, Istanbul when all three spaces will meet. During this time on January 26, 2011, Wednesday at 6 pm, Arrow Factory and Collective will present a talk** at PiST/// about their spaces and following this PiST/// will make an introduction about How to Turn the World by Hand? via Beijing_Edinburgh_Istanbul. * How to turn the World? via Beijing_Edinburgh_Istanbul, Istanbul_Session_01, is supported by Creative Scotland. 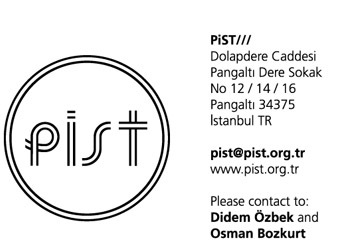 PiST/// would also like to thank the support of Foundation of Arts Initiatives and Istanbul Guncel Sanat Dernegi. ** The talk will be in English. *** Every time I look out of my window, I see an Asian woman constantly sewing. Maybe, she has sewn the 'Made in Turkey' shirt I have liked in Edinburgh.